If May was the month that studios dipped their toe in the summer waters, June was a time when they waded in up to their waists. The first weekend in June saw three high-profile releases, each catering to different audiences to mixed results. After last summer’s disaster Tammy (my worst film of 2014) I was mighty suspicious of Spy, Melissa McCarthy and director Paul Feig’s action comedy. After having such success with Bridesmaids the duo reteamed for the underwhelming The Heat so it was a 50/50 shot at how well Spy would do. Lucky for us, it was McCarthy’s best performance to date and by far her most enjoyable film as a solo star. A great, game supporting cast helped make this highly entertaining. I never watched HBO’s Entourage but felt like I knew what I was getting myself into when catching the big screen outing for the California guys navigating their way through Hollywood and a bevy of beautiful women. It was pretty on par with my expectations but I wasn’t lost in the wilderness with its plot. It was nicely made and an adequate diversion for the time I spent in the theater. Review: I’ll say this for the third chapter of the Insidious franchise…it’s a lot better than the meandering second outing which strayed a tad too far away from its original mythology. A prequel to the two films, Chapter 3 focuses on a motherless girl that becomes the target of a pretty nasty specter of evil. It’s all fairly standard stuff but not quite as chilling as it thinks it is. The performances sat well with me and I loved that Lin Shaye, an actress that’s been in the biz for quite some time, was brought front and center because she ably carries the picture. I think it’s time to close the book on these films, and it didn’t go out as a total embarrassment…but it could have been handled better. For some time now, the film I’d been most looking forward to was Jurassic World and on June 12 the film was released to thunderous acclaim from audiences and critics. 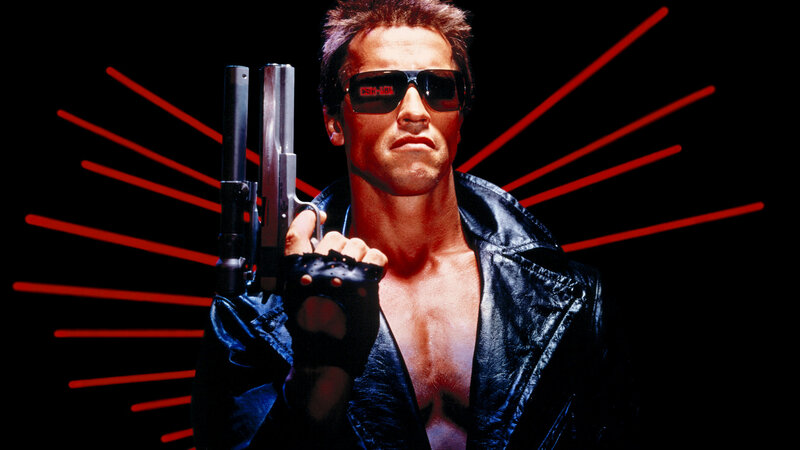 It quickly broke box office records around the world and squashed any fears that the franchise had run its course. I loved it and happily saw it a second time in 3D IMAX, enjoying it even more on a repeat viewing. Now the wait begins for the next one…and I’m intrigued to see where it’s going next! Halfway into June two dramas were released to good reviews but audiences didn’t quite seem to find them and I can only hope that they’ll find more success when they become more available via streaming services or rentals. Synopsis: High schooler Greg, who spends most of his time making parodies of classic movies with his co-worker Earl, finds his outlook forever altered after befriending a classmate who has just been diagnosed with cancer. Review: I hardly expected to well up with tears at a movie from the director of the remake of The Town That Dreaded Sundown and several episodes of American Horror Story. But I did. 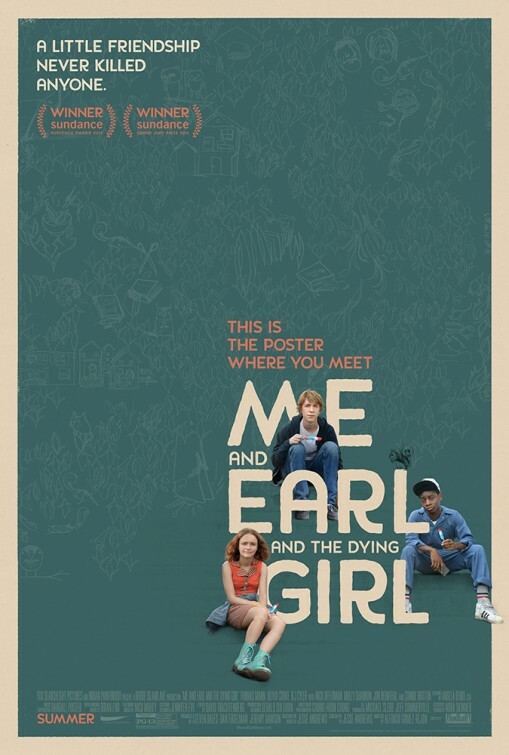 Eschewing the gauzy mawkishness of the disease of the week melodrama, Me and Earl and the Dying Girl is a creative tear jerker that will make your mascara run…but maybe for not the reasons you expect. It’s almost worth the price of admission to see the titles of the parodies of classic films that are produced by our lead characters…but there’s much more to love about this sweet, knowing film that had a tender heart around its rough edges. Very much worth your time. 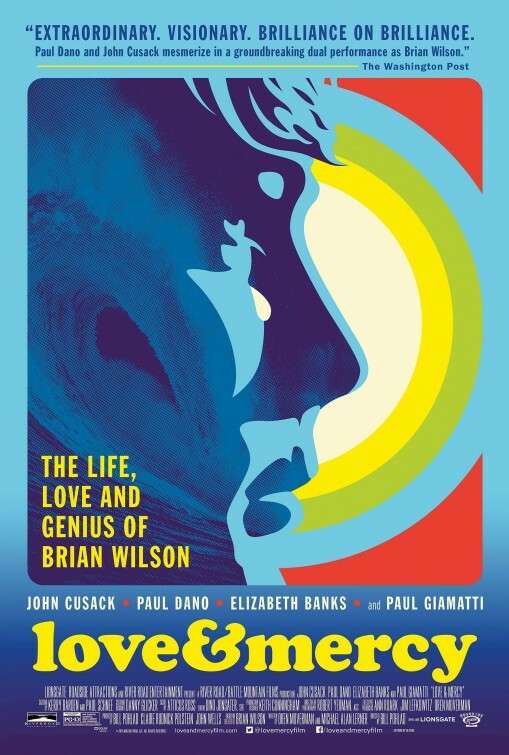 Synopsis: In the 1960s, Beach Boys leader Brian Wilson struggles with emerging psychosis as he attempts to craft his avant-garde pop masterpiece. In the 1980s, he is a broken, confused man under the 24-hour watch of shady therapist Dr. Eugene Landy. Review: I almost let this one slip of out theaters before catching it and I’m so glad I did. It’s one of the best biopics (music or otherwise) that I’ve seen and features uniformly excellent performances…and this is an especially big accomplishment considering I’m not a fan of the three of the four lead actors. I normally find Paul Dano to be a bit like a marshmallow, puffy and flavorless but he presents a deeply nuanced portrait of Brian Wilson, the Beach Boy that suffered from mental illness and madness for most of his life. His brilliance is expertly captured by Dano, less so by John Cusack as the elder Wilson that enters into a relationship with a car saleswoman (Elizabeth Banks) while being treated by a therapist (Paul Giamatti) with questionable morals. Banks is great as always and whatever annoyances Cusack, Giamatti, and Dano have provided in the past are forgiven in director Carl Pohlad’s riveting look into the mind of a troubled man. Now that I think about it, June was a month with movies that gave my tear ducts a run for their money…never more so than the one two punch of Pixar’s latest and greatest. Before Inside Out even started, I was wiping my cheeks thanks to their moving short Lava. Entirely set to the music of the Hawaiian islands, it’s a heartfelt tribute to love, dreams, and destiny. I bought the song from iTunes and yes, was moved to tears just listening to the beautiful melody again. Synopsis: After young Riley is uprooted from her Midwest life and moved to San Francisco, her emotions – Joy, Fear, Anger, Disgust and Sadness – conflict on how best to navigate a new city, house and school. 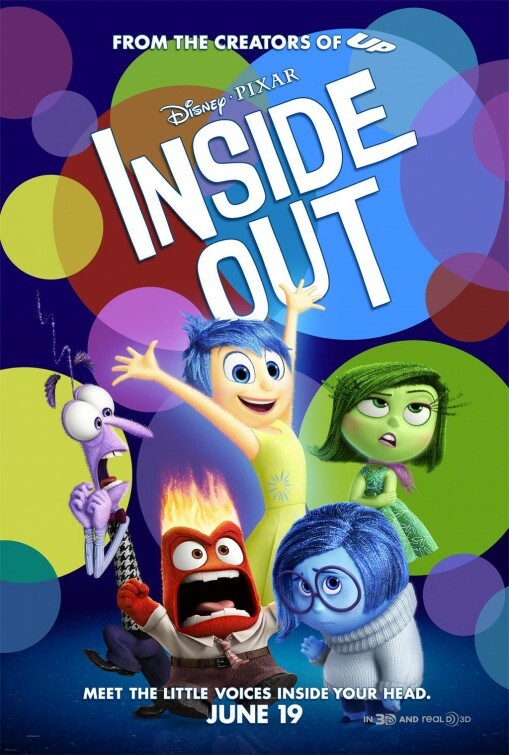 Review: Stumbling a bit in recent years by focusing more on sequels instead of original material, the genius minds at Pixar came back in full force with Inside Out, their little lesson to audiences young and old that having emotions and showing them is natural…and a good thing. It’s difficult to present a message like that in a way that will speak to young children as well as the adults in the room but by George they did it. Growing up isn’t easy and feeling the loss of childhood is painful, but the gentle hand guiding the film helps us come to terms with those emotions in the best and brightest way. The waterworks started early and kept on going through the credits. A lovely film. STAY TUNED FOR JULY & AUGUST!